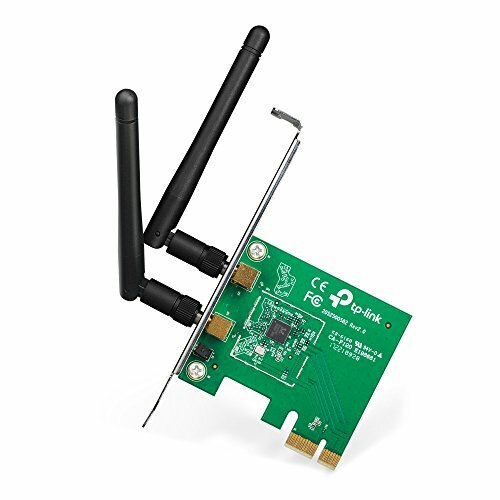 What This Product Does: Wireless N PCI Express Adapter TL-WN881ND allows you to connect a desktop computer to a high-speed wireless network. Using MIMO (multiple input multiple output) and CCA (Clear Channel Assessment) technologies, it provides a fast and reliable wireless connection with speed up to 300 Mbps. Key Features: 300 Mbps Wireless N with MIMO and Increased Stability with CCA Technology. Specifications: Support 64/128 WEP, WPA /WPA2/WPA-PSK/WPA2-PSK(TKIP/AES) wireless encryption; Support Windows XP 32/64bit, Vista 32/64bit, Windows 7 32/64bit, Windows 8 32/64bit.